More than a year has passed since the introduction of tougher penalties for drivers who use a mobile behind the wheel, but new research has found that just a third are aware of the consequences of phone driving laws. The penalty for using a mobile phone at the wheel was doubled in 2017 to a minimum fine of £200 and six endorsement points. Car drivers who go to court face a maximum fine of £1000 while bus and HGV drivers can pay up to £2500 in fines. However, despite the tougher stance, just one third of drivers are fully aware of the legal consequences of using their phone behind the wheel. 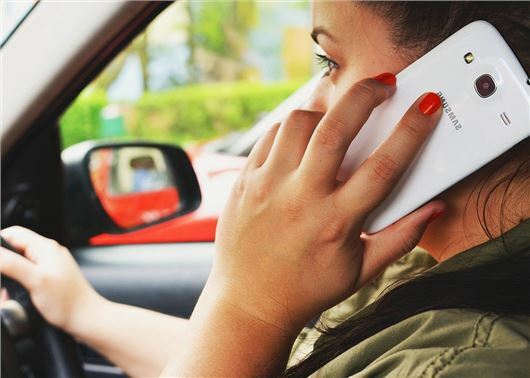 The RAC surveyed 2000 drivers and found that just 36 per cent could correctly state what the current penalties are, while one in 10 declared the risks of using a phone and driving at the same time were ‘overstated’. Latest Department for Transport figures show that the number of fatal collisions caused by motorists using a mobile phone while driving are rising. There were 32 fatal collisions in 2016, up from 22 the year before, and a total of 2210 collisions of all severities where a mobile phone was involved between 2012 and 2016. Previous RAC research suggests that around nine million UK motorists habitually use a handheld phone while driving. What does the law say about using a phone in a car? It is illegal to use a hand-held phone or similar device (an iPad or laptop, for example) while driving a car or riding a motorcycle, including when stopped at a red light or when queuing in traffic. It’s also illegal to use a mobile device when supervising a learner driver or rider. What happens to drivers caught using their phone? Drivers receive an automatic six points and £200 fine. For most, that means being caught twice will result in a court appearance, a fine of up to £1000 and a driving ban of six months or more. New drivers will automatically lose their licence after a first offence. They will then have to reapply for a provisional licence and retake their driving test. How can I legally use my phone at the wheel? If your phone is in a cradle then you may press a single button to accept calls when on the go, but pressing multiple buttons – for example to send a text – is illegal. It is, however, legal to make and receive calls using a hands-free system. Most new cars get a built-in Bluetooth system fitted as standard, which allows the driver to use their phone legally. However, even when using a legal hands-free kit, the Police may charge drivers for careless driving, dangerous driving or driving without due care and attention, if they think it is affecting their standard of driving. If you need to make an emergency call to 999 or 112, for example if you have witnessed an accident, it is legal to use a handheld mobile phone while driving, but only if it is unsafe to pull over and stop to make the call. This rule only applies in England and Wales. Using a hand-held mobile should be mandatory 12 month ban as it's just as serious.as drink driving. wise up about cellular communication legality and cyclists not wear ear phones. The use of seat belts was advertised very widely and persistently. The dangers of mobile phone use and the penalties should be advertised similarly.